How many people cycle to work? There are 762,300 people who cycle to work in England & Wales according to the last Census, an increase of +17% on the previous results. 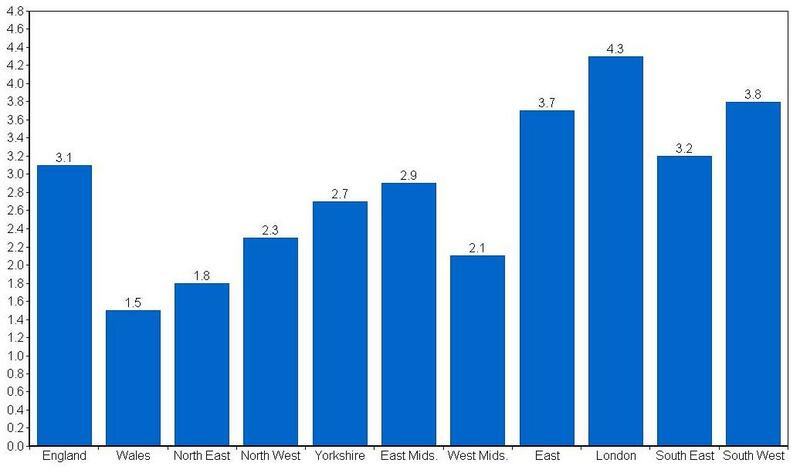 London has the highest growth at +109%, equating to 4.3% of total commuters. Overall, cycle commuters account for 3.0% of all that commute to work. This is a staggering 12,000 million commutes per year. The proportion of the population who travel to work has increased to 44.7% (2001: 41.0%). The number who drive to work has exceeded 15 million for the first time. This equates to 7,325 million car commutes per year. In Part III of this report, we focus on what we love most, Cycling. So far, we have established that the number of people who travel to work in England and Wales is in excess of 25 million. Not only is that the highest ever level but it is also growing at a faster rate than the increase in population. Additionally, a greater proportion than ever of the population (44.7%) travel to work. As Cyclists who commute, we compete with other road users, such as buses, taxis, lorries, vans and of course cars. The number of cars available to UK households has increased to 27.3 million, of which, 15 million are used daily to travel to work on 7,325 million journeys. It is with this backdrop that we take a look at the people who, against all the challenges they face, travel to work on a bicycle. The number of cyclists who travel to work by bicycle has increased by +17% over the past ten years. The 30 year change is an overall decline, although Wales, North East, London and South West Regions have all seen an increase. London cycling commuters more than doubled (+109%) over the past ten years, at a time when car driver numbers increased by just +1% (England Average: +16%) and the ratio using Public Transport reached record levels; at more than half of all commuters for the first time (52.6%). Our recent article on Cycle Commuters in London goes into this in greater depth. It is perhaps only when we see the London results alongside other regions that we truly see the magnitude of their results against others. Note: Numbers refers to the total number of people who travel to work by that method. Ratio refers to the number of people as a percentage of the total number of people who commute (for all methods). % Change is the ten year change (2011 v 2001). The report uses data from the Office for National Statistics (ONS) as provided by the Nomis website and where available will show data by Region, Area and Local Authority, all of which are defined on the Nomis website (www.nomisweb.co.uk). Data is released in stages by the ONS and as such, we have had to focus on England and Wales for this report. We do not wish to alienate the good people of Scotland, Northern Ireland and other parts of the UK but we don’t have data for those areas. We will of course update the report once available. Whilst data is available from 1991 and 1981, it is based on a 10 percent sample size. To enable comparisons to be made with data from 2011 and 2001, we have simply multiplied the data from the earlier years by a factor of ten. This gives a guide and is clearly not scientifically robust. Article on commuting to work by bicycle. In this report, we take a look at UK Cycling habits with regard to commuting and how this compares to other forms of transport and how this has changed in recent years.